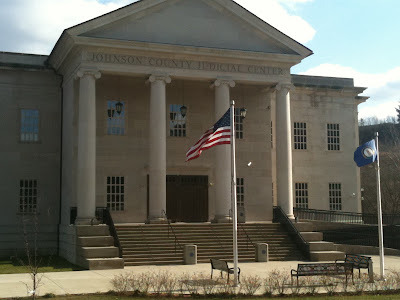 Johnson County Courthouse - Paintsville, Ky. Okay, folks. I was completely, totally lost on this one. I headed into downtown Paintsville and searched desperately for a courthouse for half an hour. No such luck. Ultimately, I did find the new judicial center (pictured above). The judicial center is nice and all, but is built right out on the bypass next to a jail. So as much as I was impressed by the Greek Revival structure, I was a little taken aback by the location. I've always wondered about the name "Paintsville." Turns out that it is pretty simple. The town draws its name from a nearby creek and early settlers found Indian drawings painted on the tree trunks along the banks of the creek.